I am honoured that one of my paintings will be exhibited in a new Art Salon in DOX gallery in Holešovice this May. This oil painting was created in the late 90's on the eve of millennium. The 90's were very special time in Prague. After the Velvet revolution lots of foreigners started arriving to the city. Many of the new expats were creative people working in theatre, film, music, literature, and art looking for a bohemian life and inspiration in the old city that had recently gained freedom. The life was quite affordable which helped a lot. Many great events took place here such as the building of life size Shakespearean Globe Theatre in Výstaviště or the Last Underground 3 day life performances in ROXY. The atmosphere was amazing and the feeling was such that almost anything was possible in arts. The artists arriving were from enthusiasts to real professionals. Some settled here in Prague but many moved on either back to their homelands or to seek new adventure elsewhere. The two men in this painting belong to the latter. Wim De Vos, the top pictured man, had lived in Prague from late 90'. Wim has been working in theatre, film, music and arts all his life. One of his specialties are set and light design and he was involved in many theatre shows by Misery Loves Company Theatre working with directors Dan Brown and Nancy Bishop. The most important thing though about Wim is that he became a very dear and inspiring friend to me. These days he lives and works in his native Belgium and is busy with music, painting and poetry. The second man in the painting is Gregory Linington. Greg is a professional actor currently living and working in California. I remember Greg as being an excellent actor who took part in many great theatre performances in Prague at that time. 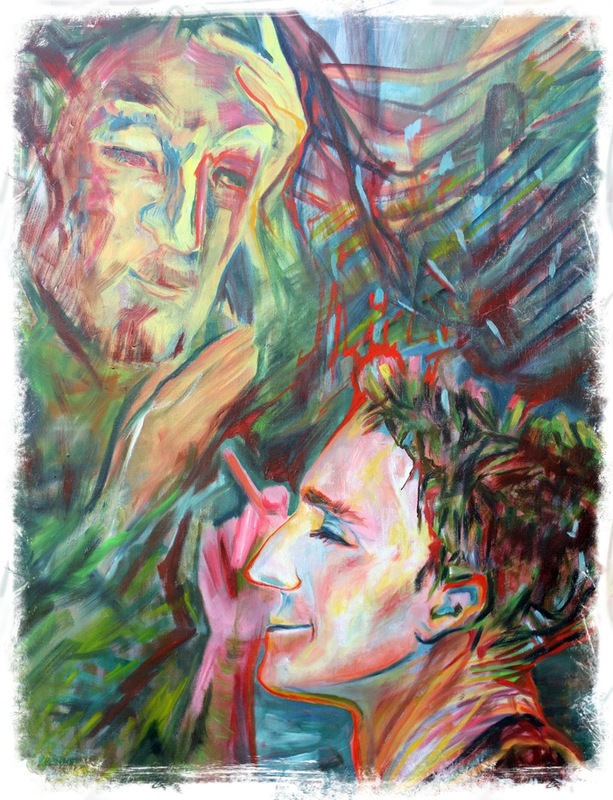 Places which also inspired this painting were Wakata club at Malířská and the old Globe bookstore and cafe at Jankovského in Holešovice. That also has quite symbolic meaning now because there I also met my future husband. At those times there were places where you would be almost certain to bump into someone from the creative expats' crowd anytime you would stop by. No sms, no phone calls, you would just go out and meet the people there. To the old Globe we would go to buy English books since there was no Amazon yet, or to have a nice brunch, or just for coffee and a game of chess. In Wakata it was for late night music, long talks about life, theatre, music, or chilling out after a theatre show. The Globe bookstore and cafe moved closer to the centre to Pštrosova street and the atmosphere has changed. It is occupying a beautiful space and it is still a very nice cafe. But it seems to be more frequented by tourists these days. As life in Prague went on the original expat group dispersed and life in the city became less and less affordable for any bohemian life. These days you are more likely to bump into expat groups that consist of young professionals working for international corporations in areas such as IT or banking. Although there are still some enthusiasts that have managed to either keep their costs down or who became successful in their area of arts to support themselves in the more expensive times. I would like to say that it is people that inspire me most - in life and in art. And few paintings from the past are silent and colourful witnesses that speak of the beauty and inspiration that some people brought to me at the time.